Want to learn more about St. Louis Community College? When was the last time you visited a campus? Are you interested in classes? How about a tour? 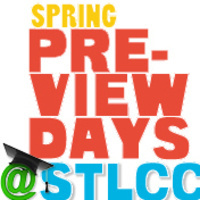 St. Louis Community College is hosting Spring Preview Days for future students and families, area residents and anyone who wants to learn more about the College. You are welcome to join us for the entire event, or any amount of time that works for you. Discussions on getting started and why STLCC? Guests can explore academic and career programs, take a tour and enter a drawing for a 6-credit hour tuition voucher (two at each campus).